We know that carers are often “hidden” looking after a family member or helping a friend or neighbour with day to day tasks and may not see themselves as a carer. A carer is someone who, without payment, provides help and support to a partner, relative, child, friend or even a neighbour who just could not manage without their care. Carers can be very young to very old and from all walks of life and cultures, juggling jobs, children, school work and their own health needs. There is support out there and here is one way of accessing some of that support. Caring for someone is an important and valuable role in the community, which is often a 24-hour job that can be very demanding and isolating for the carer. Carers should receive appropriate support by way of access to accurate information on a range of topics such as entitlement to benefits and respite care and not least, a listening ear when things get too much. We are interested in identifying more of our patients as carers, especially those people who may be caring without any help or support. If you are a carer, please either ask at Reception for a CARERS IDENTIFICATION AND REFERRAL FORM Or click on ‘please let us know’ below and complete one now on line and let us know about your caring responsibilities. As a Carer, you are also entitled to have an annual health check as we know that your caring responsibilities could have an impact on your own health. Please book an appointment with one of our practice nurses. Please also remember to book your appointment for your free flu vaccination at the beginning of September. Ensure you inform the reception team that you are a carer and we will find a suitable appointment to fit around your availability. Your surgery Carers Champion in Emma Heaton – We realise, as a carer, things are never straight forward and we want to help wherever we can. Please ask to speak to Emma for help and advice at the surgery. 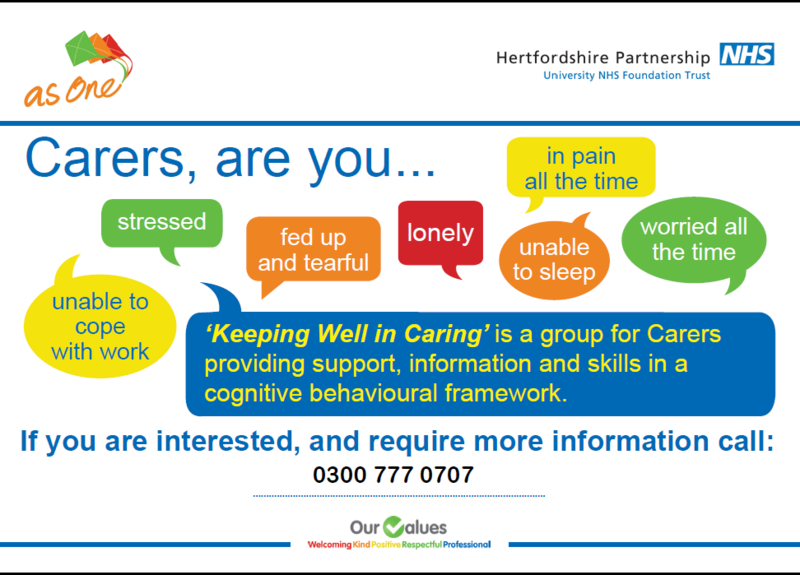 In addition Carers in Herts, a local, independent organisation offers support and signposting for carers. Support - What’s on locally?